After a five-month battle with urethral cancer that he shared with fans and friends through daily Facebook posts and regular YouTube videos, comedian Ron Shock died today. He was 69. 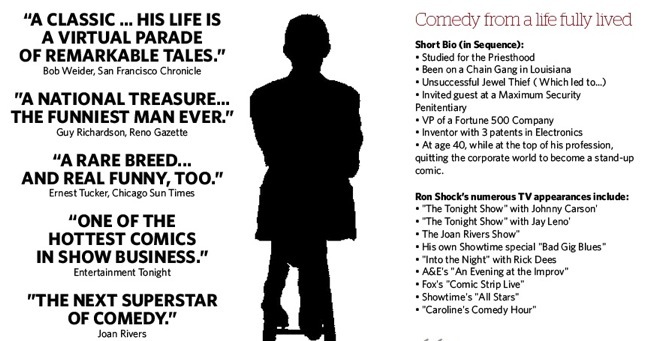 Ron Shock began his comedy career relatively late at the age of 40 but did so in Houston where he was a fellow “Outlaw” with the late Bill Hicks. In December 2011, he announced that he had been diagnosed with the rare and aggressive urethral cancer. Shock then moved to Las Vegas where he underwent chemo and other treatments. His wife, Rhonda, and others encouraged friends and supporters then to donate directly to Ron Shock’s Cancer Fund via PayPal to help with the mounting bills. Up until the end, Shock continued to share his ups and downs via Facebook. He also uploaded a series of videos called Cancer Chronicles in which he spoke about his health and recounted various stories from his life on the road. Here, Shock described his final conversation with Bill Hicks on the day before Hicks died, and what happened the following day. Just two weeks ago, Shock shared these words about how nice everyone was treating him at hospice. PreviousBrody Stevens brings his positive energy to Conan. Enjoy that!